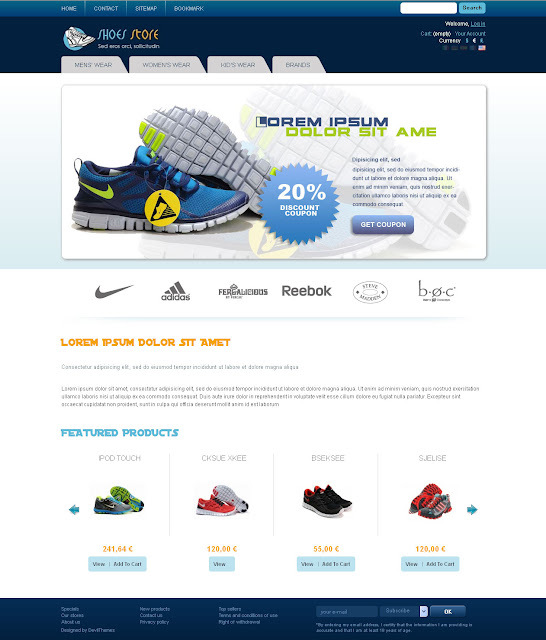 This Prestashop themes is in black background with fixed width. This theme is suitable for dressing, wears, suite, coat, paints, tie, cloths for mens, womens, children. 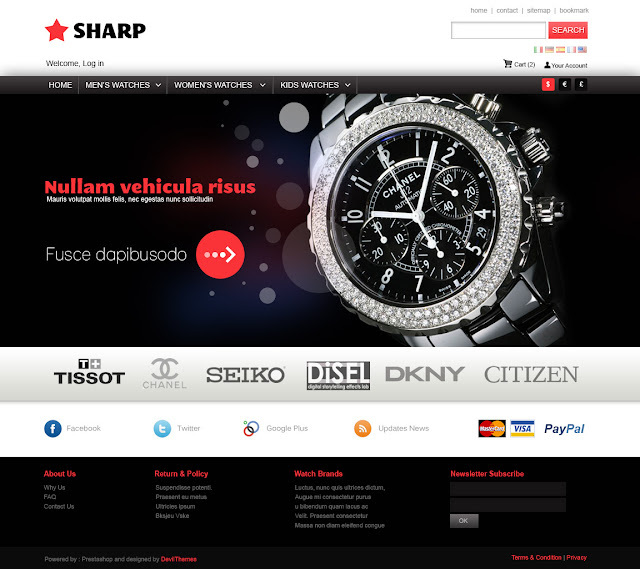 Sharp Themes (1 column in home page and 3 columns in next pages) design is suitable for jewelery and watch eshop. This theme comes with social links with facebook share link. Product catalog is in top menu and newsletter with manufacture links.It’s easy to install and do not takes more than 5 minutes. This Sky Prestashop Themes is designed in blue color with professional look and feel . Here, we have included front slide show with back office system for looking more professional and beautiful. Curvy Blocks makes extra tidy and clean. This themes is well documented in 5 different languages English, French, Spanish, Italian, German. Except English, all remain four languages are automatically generated through google translate http://www.translate.google.com. BlackInk theme (3 Columns Website) is totally 100% free to use on your e-commerce website . BlackInk theme is designed in simply black and white color with catelogue top navigation. This theme is more suitable for electronics, cosmetics, beauty items, toys, gift, fasion, wears eshop. Much more what I want to say is this is more versatile web template(themes). Fixed issue on map page. store.php.